Survey: Why aren’t more drivers switching to electric vehicles? The UK government is actively introducing and rolling out an increasing number of incentives in the push for electric vehicle (EV) adoption. From vehicle tax scrapped for electric vehicles (as of April 2017) to the extension of the plug-in vehicle grant to March 2018, it’s a great time to transition away from fuel vehicles and move towards an electric vehicle. According to The Guardian, only 3.3% of all cars sold in 2016 were hybrid, electric or used an alternative fuel, while diesel still represented almost half (48%) of all car purchases. But with current incentives rewarding drivers to make the switch, as well as the possible introduction of a ‘toxic tax’ to fuel drivers, why is the shift to EV so slow? What’s holding people back? We ran an online survey to get to the bottom of this. Through this, we asked drivers the big question: “What is stopping you from buying an electric vehicle?”. 16% of respondents indicated that the time it takes to charge an electric vehicle battery as a major barrier to making the switch. Currently the average time to charge an electric vehicle, from empty to fully charged, can be from 6 to 8 hours (though this varies due to the different battery capacity of individual models). Individual responses indicate the requirement for an increase in the availability of rapid chargers, as a way of reducing these charging times. Although electric vehicles are generally more expensive to purchase, there is a range of low-cost EV options on the market, as well as government grants that can cover up to 35% of the cost of plug-in cars, motorcycles and vans. So far, we’ve uncovered slow charging times, the right model currently not existing, range not being far enough and price as barriers to the switch to electric vehicles. But what is the main reason, as found in this survey…? 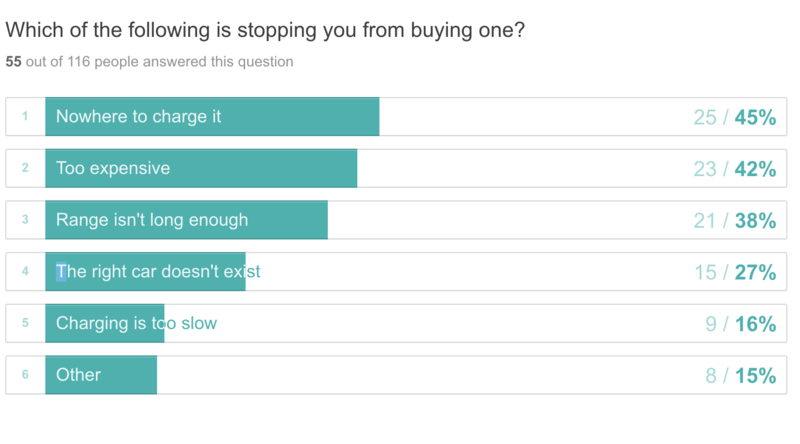 Almost half of our survey participants, a whopping 45%, listed having nowhere to charge an electric vehicle as the number one reason stopping them from making the switch. Limited means of home charging (“I need home charging first.”), nowhere to park (“No garage at home or driveway.”) and lack of street charging availability (“Live in a flat, without on street charging.”) all tell the story behind this major barrier. Say hello to char.gy – the most convenient way for you to charge your electric vehicle on your street. Now here’s the really clever bit. char.gy can be installed in the lamppost on your street, meaning there is no need to add another power supply. Installation is quick, simple and there’s no need to start digging big holes in your road. Want one in your street? Head on over to https://char.gy/car to find out if you qualify for a char.gy unit in your area. This survey was carried out in March 2017, gathering results from 55 individual respondents. Respondents were able to answer through a mix of open and closed responses.